A six week course for 2 hours each Tuesday/Thursday evening. 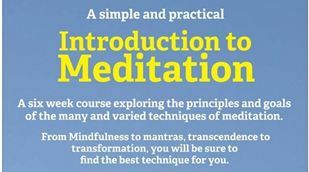 Designed specifically for beginners, those that have tried meditation but think they can't do it, and anyone interested in getting to know about the many different forms that meditation takes (there are hundreds!) to find the righttechnique for you. Over six weeks we will explore different techniques and what is achieved by each practise; relaxation, awareness, mindfulness, transcendence of thought, spiritual connection or the aid of physical or mental ailments, and many more! When you find a technique that you feel comfortable with and would like to progress you can be referred on to the relevant schools and teachers in order to be correctly trained, but the course itself will give you many tools in which to simply dive straight in and carry on with meditation by yourself with no further training. 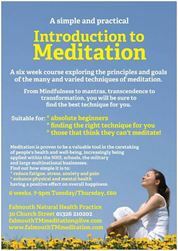 This course is held in conjunction with Falmouth TM & Meditation Group which offers ongoing support after the course at weekly meetings and through many activities. The cost of the course has been kept as low as possible to ensure participation access and is £60. Booking form and deposit of £20 required. This introductory course is open to patients, practitioners or any other interested people. Come along and learn how this life changing therapy, the work Of Dr John Upledger, could help you change the way you feel. The course is run by Jillian Aldis CST MCSS a qualified and experienced Upledger Craniosacral Therapist. Over the 2 days you will learn the basic concepts of UCST, and take away some basic techniques that you can use on your family, friends or even pets, practitioners can integrate the techniques into their existing therapy. An outline of Dr John's approach, philosophy and intentions for this work. A bit of the history and the other people who developed the field before him. Feeling the craniosacral rhythm and initiating what we call a stillpoint in this rhythm - amazing for relaxing the body and rebooting the flow of fluid around the brain and spinal cord. The course fee includes detailed study guide, tea coffee and refreshments. Victoria offer Break Through Sessions and Practitioner training, please contact us for more details.